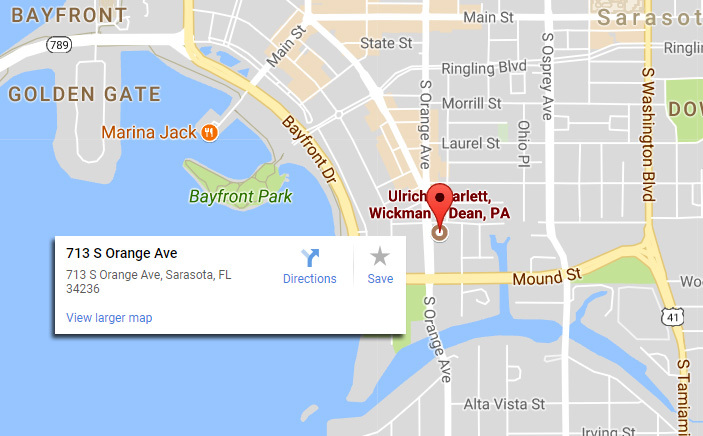 Contact Us - Ulrich, Scarlett, Wickman & Dean, P.A. 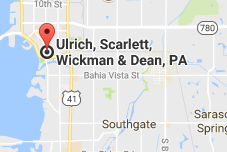 Ulrich, Scarlett, Wickman & Dean, P.A. The information on this Florida Lawyers / Law Firm website is for general information purposes only. Nothing on this or associated pages, documents, comments, answers, emails, or other communications should be taken as legal advice for any individual case or situation. This information on this website is not intended to create, and receipt or viewing of this information does not constitute, an attorney-client relationship. Data Security Breach - In the event of any breach of security, meaning unauthorized access of data in electronic from containing Personal Information, involving 500 or more individuals, the Firm will provide notice of such breach to the Florida Department of Legal Affairs as expeditiously as possible, but no later than 30 days after determination of the breach or reason to believe a breach occurred, in accordance with Florida Statutes Section 501.171(3)(a) (2015). Further any such breach of security will be expeditiously reported to the Sarasota Police. Notice of any such security breach shall be given in each individual whose Personal Information was, or reasonably believed to have been accessed as a result of the breach, as expeditiously as practicable and without unreasonable delay in accordance with the requirements of Florida Statutes Section 501.171(4)(a) (2015).